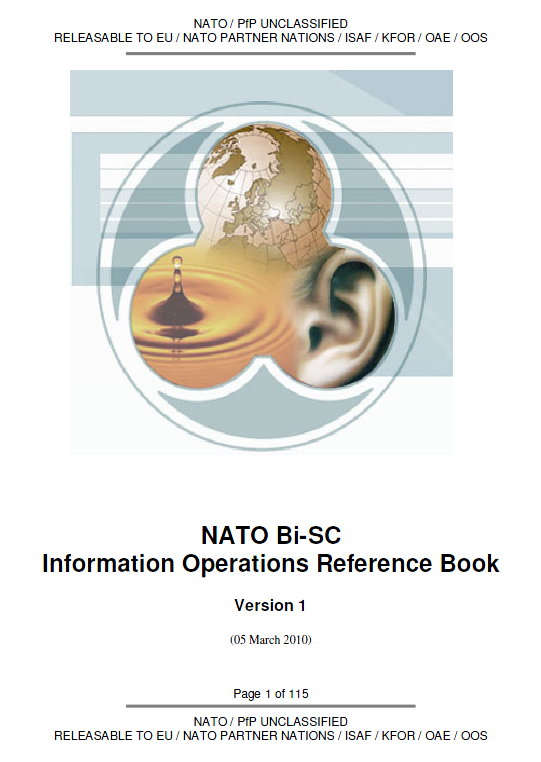 The following is NATO’s reference handbook for information operations. Though unclassified, NATO doctrine documents are not released to the public. In the information age, the strategic, operational and tactical levels are more interrelated than in the past, which demands a different quality of co-ordination and command & control across the levels of engagement. Today’s military operations to counter the complex challenges of the global security environment require consideration and integration of the information factor throughout all processes – analysis, planning, execution and assessment. This integration demands that all decision-makers at all times appropriately understand the (possible) effects of their actions in the information environment; it is not just about deliberate activity using information through means of communication, it is the combination of words and deeds that delivers the ultimate effect. A respective systemic understanding of the information environment should result in a consistent and coherent orchestration of all available means, comparable to the military concept of ‘combined arms combat’ or the philosophy of ‘jointness’ in operational art. This is a new mind-set, which requires comprehensive education and training rather than restructuring military organisations. Information Operations (Info Ops) is a military function to provide advice and coordination of military information activities in order to create desired effects on the will, understanding and capability of adversaries, potential adversaries and other NAC approved parties in support of Alliance mission objectives. The Info Ops function is understood as an integrating process rather than a capability in its own right. It provides advice to the commander and his1 staff on effects and possible information activities, and proposes solutions from a generalist’s perspective, based on a comprehensive and systemic understanding of the information environment, including cross-cultural communication. This includes the preparation, integration, monitoring and assessment of capability contributions, and the co-ordination of actions to create synchronised effects considering their relationships and interdependencies and associated resources as a function of time and space. The Information Environment is the virtual and physical space in which information is received, processed and conveyed. It consists of the information itself and information systems. The Info Ops understanding of ‘socio-technical information systems’ differs from the traditional, technical understanding of ‘information systems’. The term is used in a broader context of Systems Theory (where ‘systems’ basically consist of actors, processes, structures and supporting technology/tools) in order to introduce the human factor into communication within modern information societies. An actor’s effectiveness is a function of will, understanding and capability. In other words, actors must have the will to act, an understanding of the situation to act, and possess the capability to act. If any one of these elements is not in place, their ability to act as they desire will be affected. Generally conflict-focused, military campaigns have, in the past, aimed primarily at affecting an adversary’s capability, with the secondary aim of affecting his will. Activities advised by, and coordinated through, Info Ops addressed all three dimensions, i.e., influencing will, affecting understanding, and targeting those capabilities that promote understanding or the application of will – ultimately in order to change behaviour. Information Activities are actions designed to affect information and/or information systems. They can be performed by any actor and include protection measures. Effects in the information environment can be created by a variety of military activities, the close co-ordination of which will contribute to the achievement of Information Objectives. Info Ops advice and co-ordination will integrate military activities to: exploit information and information systems; protect own information and information systems; and counter adverse information activities. ‘Targets’ for kinetic information activities could be within the information infrastructure, and/or the IT and information-based processes of (potential) adversaries. In addition, Info Ops will contribute to maintaining the functionality of, and exploiting, own and friendly information systems. Ultimately, humans may become kinetic targets, if nonkinetic action is ineffective. ‘Audiences’ for non-kinetic information activities could be (potential) adversary decisionmakers, supporting opinion leaders and opinion formers, and their followers. However, to be able to support the full spectrum of possible operations/missions, information activities may be conducted to reinforce behaviour of friendly audiences and/or to consolidate and modify behaviour of neutrals – to prevent them from becoming adversary or hostile. d. Conferences arranged to discuss specific items of interest with influential characters. As such, commanders and leaders at all levels are encouraged to conduct “engagements” with decision makers at their respective levels (strategic, operational, tactical) and create an influence that will be beneficial for the NATO goals and objectives. The IBP is a summary of all the necessary information that the commander will require to achieve the desired influence over the key decision maker. The IBP is developed by the Info Ops staff officer and provides three (3) essential elements: messages for influence; assessment considerations; and background information on the key decision maker. All three elements combine to give the commander the essential elements of how the “influencing” activities are tied to the ongoing operations and the desired effects.